I've been meaning to post this all week long, but never got the chance until now and well, I really should be sleeping like Tony is right now - on the couch to my left - but this will mostly be pictures and a video because the pictures really say it all. and finally one of little Tony in his super cute hat! I actually feel terrible that I didn't do more for Tony for Father's Day. I had a bunch of ideas but because I wasn't feeling well the whole week before, none of them actually happened. I ordered a cute t-shirt for him from Cafe Press, but it hasn't come yet. I also had a great idea to make him a card that would be from the babies. We had some onesies that were actually from Thanksgiving last year that were 6 month size, but were more like 9 month so they all still fit into them! 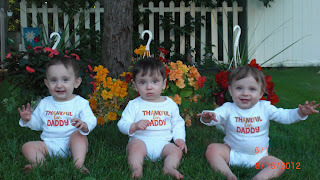 I was able to get the trio dressed and out the door while Tony was taking a break in the basement. I wanted to see if I could find a good photo spot and ended up over at his parents house using a few of their many potted flowers they had for the background. 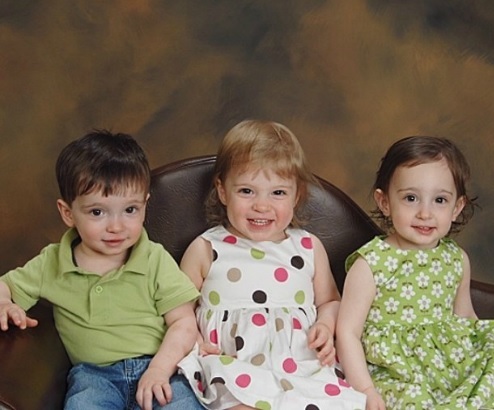 What I've learned is that it will never be easy to get them all smiling and looking at the camera at the same time. I tried 'morphing' two of the best pictures to get one good one, but then something happened and when I went to print it out to make the card, I only ended up with 2 of the 3 babies! I was so annoyed and tired as it was about 11pm when I was able to get around to doing this that I just gave up. Here are a few of the pictures I was able to get. I realized after writing the last post that I never did post any pictures or info on the baptism. We finally got the babies 'exorcised' on May 27th. I use this term because it was used during the video that we watched at the church a few weeks beforehand and I found it funny. It was at St. James Catholic Church right in our little town of Jamesburg. We arrived on time, but the priest was a little tardy so everyone, including the babies were getting a little antsy waiting. Well, Olivia was getting bit antsy. She actually got a hold of a church program and started to eat it. Amelia was good as long she was being held. Once the priest arrived, everything moved very quickly... I feel bad at this point that I wasn't paying as much attention to the proceedings that I probably should have, but I wanted to get at least a few pictures because I knew everyone else was occupied holding the babies so they couldn't take any! Amelia was looking beautiful in her dress and also having fun with her Godfather - Uncle Steve. Olivia also looked beautiful during the mass. Here she is being held by her God mother - Aunt Natalie. Little Tony was a handsome little man in his shorts suit, but he was too tired to care... Here he is being held by his Godmother - 'Aunt' Beth. Everything was over and done before we knew it and we didn't have a chance to take any pictures afterwards because we needed to leave the church because they needed to set up for the afternoon mass. I guess if we had thought about it, we would have taken our trio pictures before but there was a bit of tension in the air for a lot of reasons that I won't get into in this blog. I actually didn't get pictures of the party afterwards either but everyone had a good time. The food was great thanks to Aunt Beth and Cafe Napoli and Amici Bakery. The first bit of excitement/commotion was the dog getting out the front door and running down the street - and then watching a bunch of other people start running after him. A special thanks to cousin Zachary for actually catching up with Buddy and bringing him back home. All of the kids had fun with the bubbles that Aunt Natalie brought over and baby jail (the play yard) was a big hit. We brought it out to help corral the babies but all of the kids wanted to get inside! 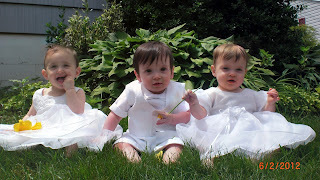 Since we didn't get any pictures of the three of them that day, we dressed them up in their dresses/suit so we could get a good shot to send as thank you cards. We actually didn't get any with them all looking in the same direction, but luckily because I took so many in a row, the photo editor on this computer was able to morph two of the best shots into one and we got this one. I've been very lax lately, and know there are alot of things I should write about, and hopefully I'll remember most. This past week, my trio hit their 10 month birthday. I can't believe where the time has gone. I look at pictures of when I first brought them home and look at them now and am amazed at how far we've all come. Amelia is still our smallest - weighing between 15-16 lbs as of a few weeks ago. She can crawl pretty fast now and easily pull herself up from sitting and can cruise along the inside of the baby cage. She still has her good/bad times with eating but we're keeping a food log to see if there's any sort of pattern to her not wanting to eat. It doesn't seem like there is, but I can tell that if she's forced to finish her bottle, she will no doubt throw it up. We go back to the pediatrician on Tuesday as a follow up from her being sick a few weeks ago and to see if she's putting back on the weight she had lost while being sick. She's still our most 'sensitive' baby and will cry when she falls over whereas the other other two seem to take their lumps a little better. She can also be the most smiley baby at times - so you never know! She's got 3 teeth (two bottom and one on top) in and the other top tooth is appearing. She's mostly wearing 9 month clothes, but can still fit into some 6 month stuff. She continues to be a good sleeper/good nap taker and everyone says she looks just like me. Little Tony is my sweet little man. He's such a happy baby and has mastered the ability to pull himself up on anything and everything like his sisters. He is a great eater (he weighs between 18-19 lbs) but not such a great sleeper. I've learned that he likes to stay up later after he eats his dinner. If he gets put to bed right after he eats, he'll just cry in his crib. Lately, I'll just pick him up and sit with him for about 10 minutes on my bed quietly and then put him back in bed. He seems to go right to sleep after that. Tony doesn't want me to get him into this 'habit' but I honestly don't mind doing it most nights because I don't usually get to spend alot of time with each baby (individually). So this is my time with him and I enjoy every second of it. He will also be seeing the pediatrician on Tuesday as a follow up from his ear infection. Sometimes when he cries at night, I'm thinking that the infection is coming back and I really don't want that - those were some bad sleepless nights. Despite him being a great eater, he's terrible at taking medicine. He HATES it - not sure if it's the flavor or texture, but either way, it's a struggle to have him drink it. He's got his two bottom teeth, but the two top ones will be emerging very soon and he's fitting into 9 month clothes these days. Olivia continues to amaze me with everything I see her doing. We were at my cousin's house today for a visit and we didn't have the baby gates up and I was able to watch how fast she can crawl! She's can really get around. She's able to stand up without assistance for about 30 seconds at a time (not holding onto anything) and I love to watch her as she figures out new toys. What I don't love to watch is her being a bully. She's the one who steals the toys away from her brother or sister. They'll be playing with something and the next thing you know - she has it. She also is the biggest hair puller. She'll even tug on the hair of whomever is getting their diapers changed (because her crib is right there.) I just hope she doesn't do what I've heard from other people about their multiples - bite each other. She's got 7 teeth and more are coming in. She's still the one with the most drool, but the tooth cutting doesn't seem to bother her too much. She's around the same weight as Tony, but doesn't have an appt with the pediatrician although she'll becoming along with the gang. I'd actually like her to be seen because she still has a cough. It's one of those loud rough wet coughs, but we're not able to give her any meds to clear her out so we just continue to use the humidifier. She's not as congested (snotty) as she was but still has the cough - poor baby! So this weekend marked our first baby hair cut. Little Tony's hair was getting pretty shaggy and we decided to get it done because Tony had to get his done too. Here's a few pictures of the experience. Tony's mom came and saw what a good little boy he was. He didn't cry at all and both ears are still intact! Olivia and Amelia were also good babies while they waited for their brother's hair to be done. Little Tony watching as his daddy got his hair cut! Today we took a short road trip to my cousin Tracy's house. A little back story on what prompted this visit. I belong to a triplet mom facebook page and noted that someone had posted that she'd like to donate her unused Alimentum formula to someone who has triplets. The only problem is that she lives in Connecticut. I emailed her a few times and we were able to work something out to get me the formula for my little peanut, Amelia. This MoM got the formula through her insurance to didn't feel bad just giving it away. This was really cool of her and can't believe others' generosity and makes we want to help others when I can. Well, the pick up of the formula included my Uncle who lives very close to where this MoM's father works in Tarrytown. It all worked out and I came home after a nice visit with about 60 bottles of the ready to feed formula. This should likely get us to a year old when she may not have to drink too much more formula. This past week, I also got together for my MoM club's 'instillation' dinner. The best part of the whole thing other than the food was the kindness of a fellow MoM. She had brought me 3 huge bags of clothes for the babies. Speaking of other MoM's - I met a fellow triplet mom - she started the local consignment shop in town (http://www.facebook.com/pages/Little-Rascals-Consignment-Shop/144569045657227). There isn't anything I need right now, but I'm sure this place will come in very handy in the near future! I think that's about all for tonight, I'm beat! Wait one more really cute picture ! I took this today. So fun to watch them in their walkers! This was the traffic jam that was created by Olivia! Hilarious! Olivia is the one looking back to see the chaos she's created and Amelia is crying cause she's stuck and Tony - well, he's just chillin'!